You walk into a beauty supply store. You see 9 aisles of hair products. How in the WORLD do you choose which ones to use? If you're like I was, you buy one of almost everything, try them out, and then throw them out several weeks later. And since I don't think that any of us can afford to keep wasting money, let us not do that anymore. We're in an economic crisis, for crying out loud! I think it's high time we all hop on the "Help A Sista Out" train. The reality is that most of the products in beauty supply stores are geared towards relaxed hair. As such, most of the styling products are designed to be light, so that they don't weigh the hair down. On relaxed tresses, heavier creams or gels can make the hair look greasy and limp. The coating is so moist and thick, that the heat from curling irons can't create the desired effect. The result? A very frustrated woman with lifeless looking hair. With natural hair, however, especially of the "curly-knotted" persuasion, heavier creams and gels are staples for day-to-day maintenance and styling. Nothing defines a curl better than a rich emollient that can hug on each strand. 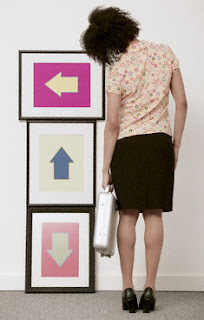 Lighter products generally aren't heavy enough to create that effect for more than a few moments. Now, here's a disclaimer. Since our hair textures differ across the board, even among siblings, no two heads will respond to a product exactly the same way. 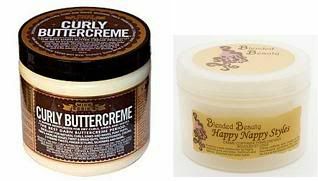 If your hair is more loosely textured, or not very dense, or both, then heavier creams could create the same effect on your hair that it would on relaxed hair. You have to know your hair. Well... at least a little bit. My natural hair, at its "purest", resembles a bale of dark cotton. Maybe what you'd get from an anorexic lamb, since it's not very thick or dense. It's just nappy, O.K.? There, I said it. But, when I keep my hair moisturized, and keep my ends sealed, and condition regularly, it's like night and day. So if you're trying to tame the angry beast (ie. the natural hair that you don't know how to manage), here are a few of my favorite things. This line of shampoos uses Coconut Oil-Corn Oil Soap for lather, rather than the harsher, more prevalent, Sulfate detergents(Sodium Lauryl, Sodium Lareth, Ammonium Lareth, etc...). It's milder, but it still does a good job of washing dirt and product build-up out of the hair. 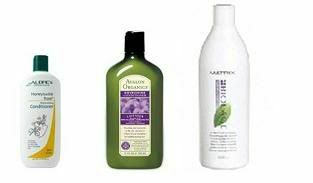 You can find these shampoos at Whole Foods, Trader Joe's, or on the web. I'm a big fan of being able to pronounce and recognize the ingredients on hair products, which is why I smile when I read the ingredients on the bottles of the 1st two conditioners that I mentioned. I feel like I'm helping my hair AND the environment when I use them. My hair feels its softest when I use the Aubrey Organics Honey Suckle Rose Conditioner. It has a very light floral smell that reminds me of how lotion used to smell when I was little. It comes in an 11 oz bottle, and costs around $10.00. The Avalon Organics Lavender Nourishing Conditioner smells like, no surprise, lavender. They have two different sizes, but the 32 oz bottle, which I buy, costs between $13-$17.00. The 3rd product, the Biolage Detangling Solution, has a few more standard chemical names in the ingredients, but MAN, does it detangle! And I love the smell! (A little tip-- I went to B.J. 's Club the other day, and saw the store brand version of the Biolage Detangling Solution. It was called Berkley & Jensen Detangling Conditioner. It was $4.99 for a 40 oz bottle, and smelled exactly the same as the Biolage version. The Biolage 33.8 oz bottle costs about $22.00. I'm just sayin'). You can find the Aubrey Organics line and the Avalon Organics line at Whole Foods, Trader Joe's, other health food stores, or on the web. Biolage Detangling Solution can be found in most mall hair salons, and online. Nothing moisturizes my hair like Miss Jessie's Curly Buttercreme. When I use it in my hair, the moisture actually stays, unlike other creams I've used that have only kept the moisture in for 20 minutes or so. It's VERY HEAVY, so you don't need to drown your hair with it, like you might have to do with other moisturizers. It has a strong peppermint scent, and it tingles on your scalp a little (in a good way). For those with looser or less dense coils, this product might be a little heavy or greasy. But for those with tighter or thicker coils, this product works like a dream! Other than its thickness, the only other complaint I've heard about it has to do with the fact that it contains the dreaded mineral oil and petrolatum. Hmm... so much controversy over those two ingredients. Some sources report that both of these ingredients are by-products of crude oil, and that they block the pores and rob the hair of moisture. Others sources report that the cosmetic versions of these ingredients are extensively refined and therefore do not block the pores or rob the hair of moisture. 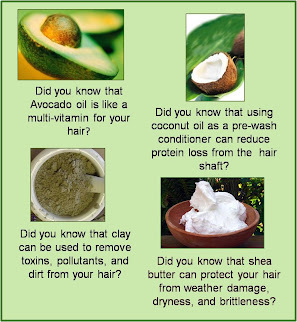 Health wise, neither mineral oil nor petrolatum help the hair, even if they don't necessarily hurt it. So until further substantive information is available, you'll have to make the best choice for you. As more information becomes available to me, I'll be sure to pass it on. In the meantime, if you do choose products that contain mineral oil (paraffinum liquidum), or petrolatum (petroleum), you're probably better off choosing those in which both of those ingredients are way down on the list. Ingredients are generally listed in their order of content contribution. So, if an ingredient list starts off with mineral oil or petrolatum, then the product is made mostly of mineral oil and petrolatum. Out of 29 ingredients, mineral oil and petrolatum rank 17th and 25th, respectively, in the Miss Jessie's Curly Buttercreme. You can buy this product at www.missjessies.com. The 8 oz container is $32.00. The 16 oz. container is $58.00. It's a little pricey, but it lasts a while. When I first looked for a non "crude oil containing" substitute for Miss Jessie's Curly Buttercreme, I had no luck finding one in the beauty supply stores. Eventually, one of my friends introduced me to Blended Beauty's Happy Nappy Styles. Though not as oily, the richness is very similar to the Curly Buttercreme, and I always picture my hair letting out that thirst-quenched sigh, "Ahhh", whenever I use it. This product can be purchased at www.sistasplace.biz, and costs $19.00 for an 8 oz container. I love these two gels. I mean that with all of my heart. The Wet-N-Wavy gel provides a firm hold, but without making the hair feel too "crunchy" or plastic to the touch. It doesn't contain any drying alcohols, and does a good job of accentuating your natural wave pattern-- especially if you use it to slick your hair back into a fro tail of some kind. It kind of sits on top of your hair, rather than getting absorbed into it, which helps to maintain the look you styled from morning onward. It can build up on the hair if you use it several days in a row, so be sure to wash your hair thoroughly to get all of it out. 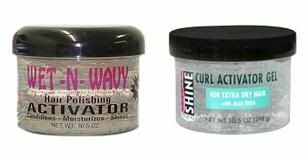 Smooth N' Shine's Curl Activator Gel for Extra Dry Hair is a unique type of gel. Used sparingly, it can impart non-shiny curl definition, and make your hair feel SUPER soft. Don't use too much though, or your hair will be left with a sticky film. Moderation is key. Both of these products come in 10.5 oz containers, can be found in beauty supply stores or on the web, and cost less than $4.00 each. So these are the products that I'm currently using, folks. I'd love to hear your testimonials on these products, or on your own favorite products, so please leave me a comment, or send me an e-mail at karen@mycurlyknots.com. This is a really great site. Congratulations, I am proud of you. I too have been frustrated with my hair and the products available which just seem to do more damage than good for my hair. I also have been noticing that a large number of young ladies are using natural products and wearing a more natural and healthy look. Your products are definitely worth a try.